To everyone that visits Hello Kitty Hell on a regular basis, it’s time to take a seat and sit firmly down. I don’t want you falling over in shock like I did. Hello Kitty Hell isn’t quite freezing over, but there is a definite chill in the air. Yes, believe it or not, there was a Hello Kitty item that my wife saw that she was only lukewarm about and even uttered the words – okay, time to hold on tight because the earth may crack open and swallow us all to our deaths – “I don’t think I need that (Hello Kitty item)” Yes, I have been pinching myself all day wondering if it was all a wonderful dream that couldn’t possible be true and have bruises all over my arms to prove it. The Hello Kitty item in question is a Hello Kitty gun which sent to me by readers Mackenzie and Dolores. I am assuming that both are photo shopped and aren’t real, but since my wife isn’t interested in them, this is one Hello Kitty item I really wish they did make. But besides that little incident, there have been nothing but sunny skies in Hello Kitty Hell with the historic even of her not wanting something Hello Kitty. I will have to savor this as I predict it is a once in a lifetime event and tomorrow will return to the Hello Kitty Hell I have known for so long. I was really puzzled by this gun, to say the least. So I checked it out and I think I’ve found the manufacturer here. It seems to be an airsoft replica, so I think your wife can get one, after all. You decide if this is a good or a bad news. While I was tracking this, I also found this interesting HK item. That’s a way to bring HK always inside your head! I have already seen a picture of this gun–i have it saved in my pictures. I have several strange Hello Kitty pics I have found on the net including a Hello Kitty fire extinguisher and other toys if you get my drift. If I was walking down the street and some weird guy approached me, if I pulled out the HK gun, I have a feeling he’d be more scared of Hello Kitty then he would be of the gun itself, HA HA! No, they’re real. Custom, but real. HK has been airbrushed, milled, engraved, printed and colorized onto a variety of weapons. And pink is the in color for women and girls. Look at that! Something that is as scary to me as Hello Kitty is to you! 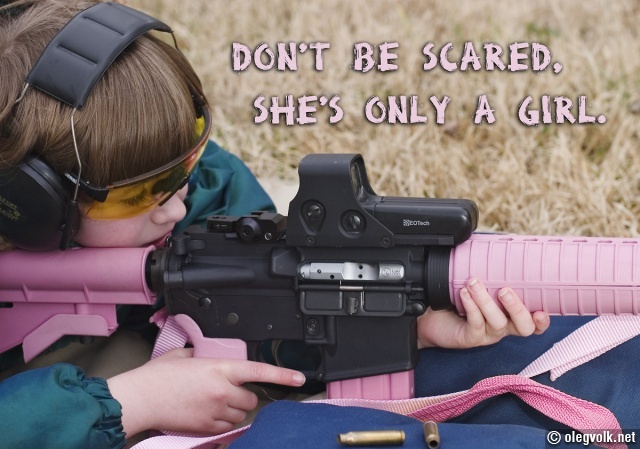 Children toting assualt rifles! I was wondering if anybody knew where I could get the “Hello Kitty” 1911 .45 pictured above. I would love to get it for my wife for her birthday, any help would be GREAT!!!!! Thanks and everybody take care!!! i have been doing some research on this alleged HK pistol. i truely beleive it was photoshopped and does not exist. the link to the other websight provides absolutely no ionformation on where to get one or how to custom order one. i work at a gun store and will continue to do research. just wondering if anyone has actually found where to get one. weeeeellllll … a squadron of Challenger II tanks, painted day-glo pink with Hello Kitty hood ornaments would go nicely with breakfast. Of course, the support crews would all have to be Japanese, diminutive, and very, very pretty ! Here is a video on cnn.com on these customized Hello Kitty weapons. Here is the real deal. They are fully operational AK’s…Awesome accessory to any girls outfit. What’s wrong with you? you obviously photoshopped an average gun, just so people would beleive hello kitty is an evil murderer. even if she DID make it, i’m sure she did it in honour of you. and you know what? you deserved to be shot by that gun. OMG HOW MUCH IS THIS?! HK in firearms terms usually refers to a Hechler & Koch firearm…guess now there could be an HK H&K. Have you ever seen the Hello Kitty AK-47’s they are so cute! 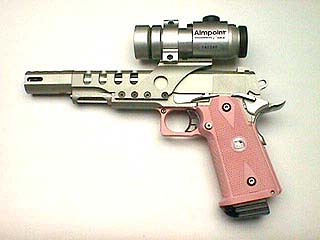 And btw there are many manufacturers that make Hello Kitty firearms. Just so you know I am a bit of a gun craze LOL I once told my brother that I wanted a Garand and a replica to paint fun colors and he thought it was blasphemy! It would be so humiliating to be shot with that thing. I think many people when questioned by police if they remember any details about the shooter would neglect to mention they were shot with a pink Hello Kitty handgun. Hello Kitty–for the very best in home defense! Did I mention I love your commenters? I love your commenters. Where do you find these guns? I was looking for a hand gun and am a HK fan and would LOVE to get my hands on one of these! HOW CAN I GET 1???? PLEASEEE tell me where I can buy the one in the 2nd photo!! Thank you!! @Ashley: I think that one might be photoshopped, but you could buy a stainless steel 1911 pistol, have it refinished in pink, and add a set of Hello Kitty grips. A site called gungrips.net can probably whip some up for you. can you direct me where i could buy that gun…. 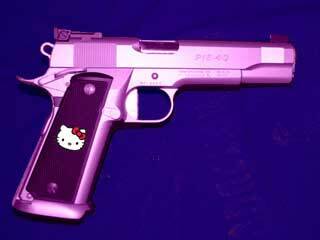 What’s a good website where I can purchase a hello kitty handgun?